Grand tour is a method for viewing multidimensional data via linear projections onto a sequence of two dimensional subspaces and then moving continuously from one projection to the next. This paper extends the method to 3D grand tour where projections are made onto three dimensional subspaces. 3D cluster-guided tour is proposed where sequences of projections are determined by cluster centroids. Cluster-guided tour makes inter-cluster distance-preserving projections under which clusters are displayed as separate as possible. Various add-on features, such as projecting variable vectors together with data points, inter-active picking and drill down, and cluster similarity graphs, help further the understanding of data. A CAVE virtual reality environment is at our disposal for 3D immersive display. This approach of multidimensional visualization provides a natural metaphor to visualize clustering results and data at hand by mapping the data onto a time-indexed family of 3D natural projections suitable for human eye’s exploration. A. Buja, D. Cook, D. Asimov, and C. Hurley. 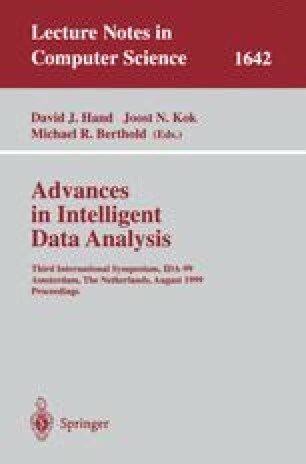 Theory and computational methods for dynamic projections in high-dimensional data visualization. Technical report, AT&T, 1996. http://www.research.att.com/andreas/papers/dynamic-projections.ps.gz. E. Keogh C. Blake and C. J. Merz. UCI repository of machine learning databases, 1998. http://www.ics.uci.edu/~mlearn/MLRepository.html.